Always a great time at The Town Tinker! I went last weekend on the water release ! It was amazing a real adrenaline rush I had not expected. The OWNER a great guy, Harry, talks to every group personally, he warned us this was going to be a rough ride and told us not to go if we were not comfortable. He even suggested looking at the river and rapids we would be in before going if we were concerned. So if anyone is blaming the business that is BS, he explained in detail what to expect - and it was AWESOME !!! 10/10 would go again - would rent a helmet! Had no problems but better safe than sorry !! Mother natures playground at its finest - THANKS !!! Went on water release day, which was nuts. Great fun!! Went on water release day, which was nuts. Great fun!! Pretty sure I broke a rib when I flipped and smashed into a rock. Blaming the business for that would be asinine...they make everyone aware of the conditions and risks, and the creek is viewable from the area near the rental shop so you definitely get an idea of what you're in for before you choose to proceed. Our family and friends have an absolute blast! 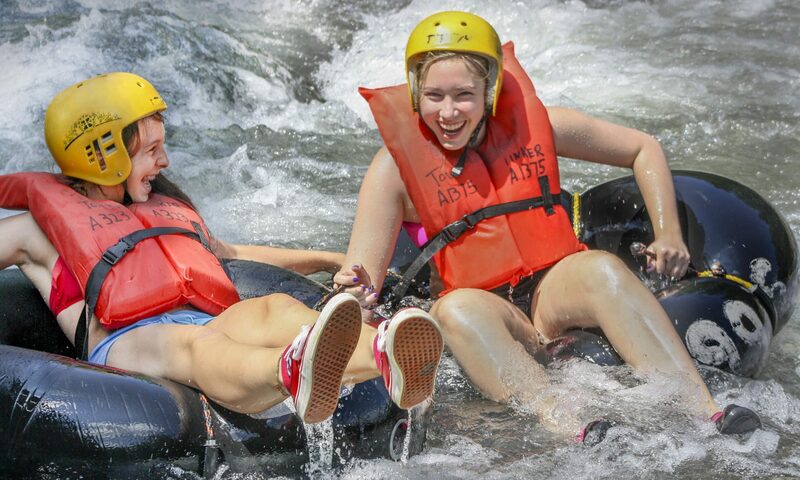 Every time we rent tubes from the Town Tinker, our family and friends have an absolute blast! We have had nothing but good times on the creek, in calm water and in rough water, and it is definitely something to try when you are in the area -- you won't regret it! A lot of fun at a reasonable price!. Sure beats the hustle and bustle of a water park! I read many reviews before going and one had me a little apprehensive. Don't believe everything you read unless it's good. We went during the week and it was quiet. No problem parking. Matt and the others at the check in were very helpful and very knowledgeable! Especially Harry who has owned the place since I went for the first time 30 years ago. Nothing has changed much and considering it's been 30 years, the prices are still reasonable for a couple hours adventure. The river was quite tame though they do have a release date coming up at the end of the month. For me the rapids and excitement were enough. I also liked just relaxing in the quiet and beauty of the Catskills during the calm areas. Sure beats the hustle and bustle of a water park! What a day, we had a blast! We went today with a group of 3, what a day, we had a blast. i also want to give a shout out to the owner Harry he is always looking out for the safety of his customers and to his credit he never lost a life in over 30+ years. We went today with a group of 3, what a day, we had a blast. keep in mind this is not a slow relaxing ride on the river there are some big drop and big rocks that you need to maneuver around them , make sure you ware a helmet and lid jackets but if you are up for the adventure this place is the best i also want to give a shout out to the owner Harry he is always looking out for the safety of his customers and to his credit he never lost a life in over 30+ years. Literally one of the best tubing experiences I’ve ever had. Literally one of the best tubing experiences I've ever had. I have been going since I was a kid. My friends and family love it. If your not comfortable with tubing or water sports in general this might not be a good fit as this is no lazy river at splash down. The river can be more intense depending on when they release from the damn. It's an absolute blast though! Enjoy!! I can't wait to go again! Since 1980. I loved it then…I love it now. I have been using Town Tinker to tube down the Esopus since 1980. I loved it then...I love it now. Went again just this summer and brought my adult kids with me for the first time. We had a blast. Personally I like to go when flood gates are not open. It's more calm and leisurely. If you like more of a rush then go when it is open but make sure you wear the helmets provided.